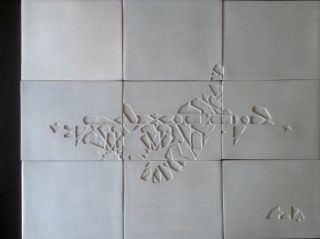 Gladstone Gallery, in collaboration with Team Gallery, is pleased to announce a new installation by Banks Violette. Violette’s work ranges from haunting yet exquisitely rendered graphite drawings to sculptural installations composed of cast salt, light, and sound. Throughout his practice, he plumbs the simultaneous degradation and accretion of meaning through the process of mythology, often embodied in forms strongly associated with sub-cultural communities, personal memorials, or historical obscurities. The black and white spectacle of his stark compositions belies the uneasy and fraught allusions of appropriated images and forms reconstructed as vessels of oblivion. 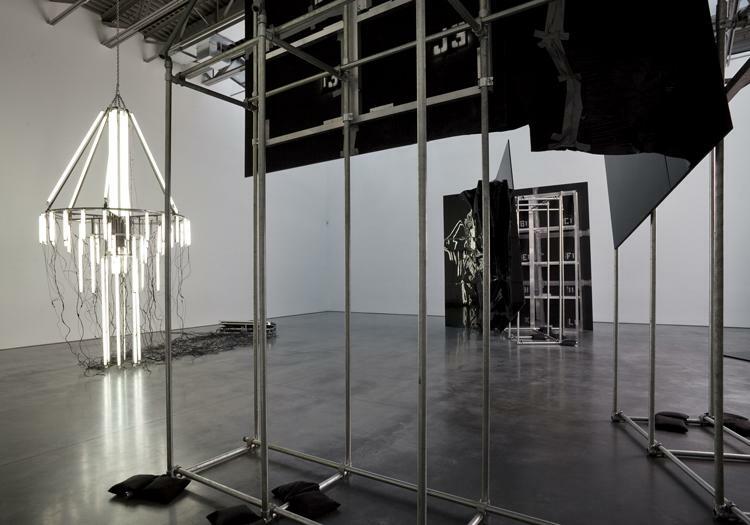 For this new installation, Violette continues to mine a rich art historical terrain in which the materials and forms associated with Minimal and Conceptual Art become reactivated as theatrical platforms of performative decay. 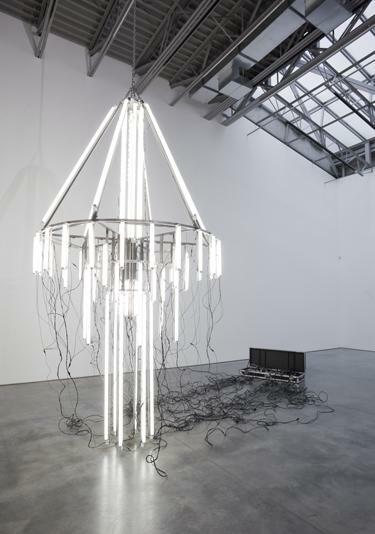 He pairs a large chandelier composed of multiple fluorescent tubes with a black wall that seems to buckle and melt against the reflection of the light. 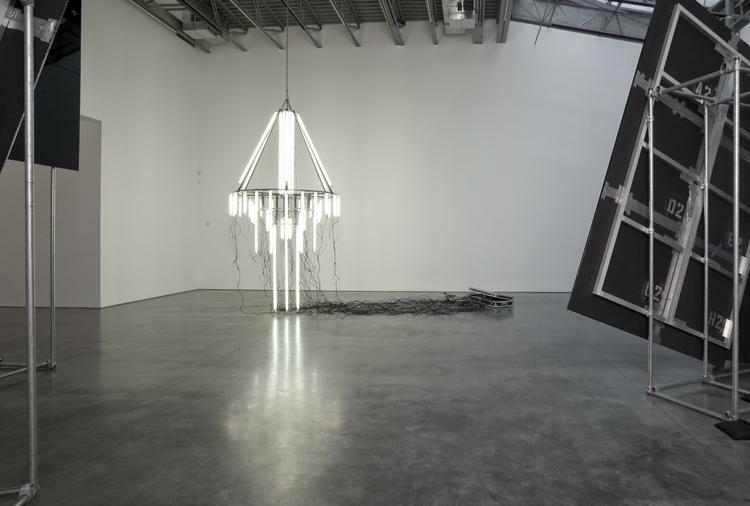 Both aspects of the installation recall the monochromatic tone and the use of replaceable industrial materials common to Minimalist and Conceptual sculptors such as Donald Judd and Dan Flavin; however, Violette’s works seem self-consciously constructed and theatrical. 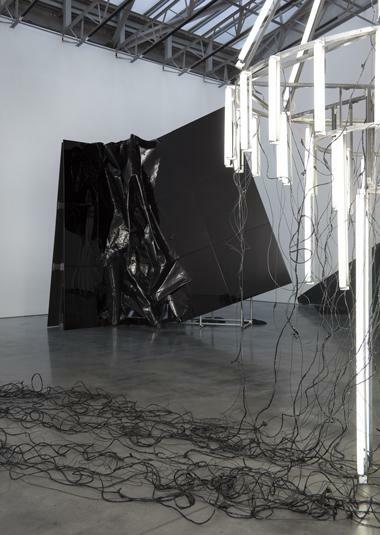 Wires fall in a cascade alongside the chandelier while the apparatus of steel tubes and sandbags supporting the wall remain in plain sight. 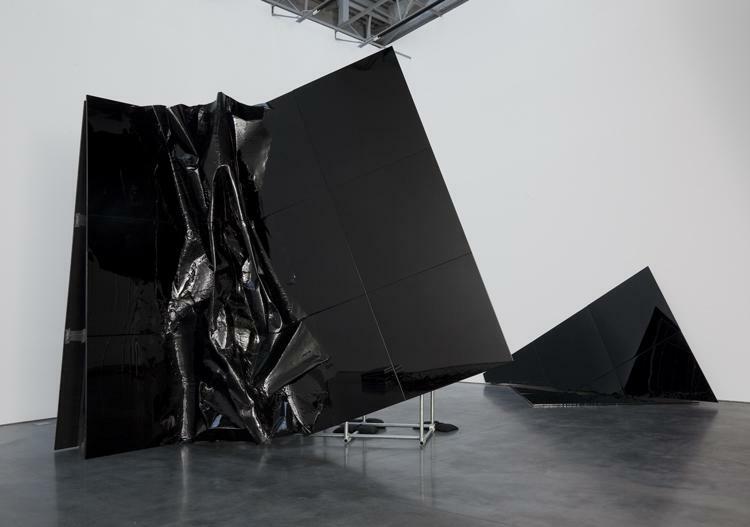 By exposing these more banal technical necessities, Violette heightens the artificial spectacle of his installation, as if willing these two canonical art historical movements into an internecine danse macabre. He unmasks form and content as sites vulnerable to intellectual vandalism and moribund mythologizing. Banks Violette was born in 1973 and lives and works in New York. His work has been the subject of numerous solo exhibitions, including those at Museum Dhont-Dhaenens in Deurle, Belgium; Kunsthalle Wein; the Modern of Art Museum of Forth Worth, Texas; Kunsthalle Bergen, Norway; and the Whitney Museum of American Art. 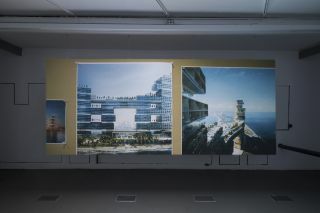 He has also participated in group exhibitions at The Solomon R. Guggenheim Museum, New York; the Migros Museum fur Gegenwartskunst, Zurich; Museum of Modern Art, New York; Palais de Tokyo, Paris; the Royal Academy, London; P.S. 1, New York; the Museum Boijmans van Beuningen, Rotterdam; among others.